Item # 282452 Stash Points: 799 (?) This is the number of points you get in The Zumiez Stash for purchasing this item. Stash points are redeemable for exclusive rewards only available to Zumiez Stash members. To redeem your points check out the rewards catalog on thestash.zumiez.com. Grabs before crabs! No wait, aren't grabs bigger and better with the grip of crabs? 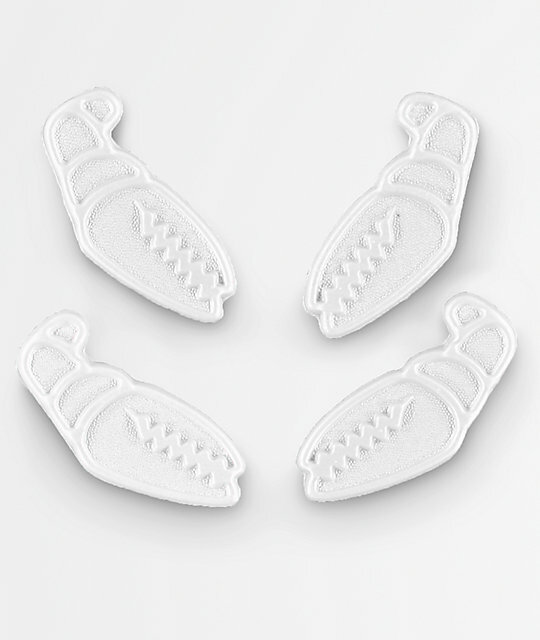 Yes, so snag this set 4 White Mini Claws from Crab Grab to create a custom traction pad design on your snowboard topsheet for one-footed tricks and skatingto and from the chairlift. Aside from your snowboard, you will get extra grip anywhere you Peel N Stick Crab Grab's Mini Claws too. White Mini Snowboard Traction Claws from Crab Grab. Includes 4 small white crab claw snowboard traction pads. Textured & beveled 3D design. C-Foam: Lightweight, heavy duty and grippy. Apply as directed by the manufacturer.